When you are in an advantageous position, it may be possible to seal the game by forcing your opponent to start a ko that he cannot win. Usually the ko is such that you make a significant gain while your opponent has no ko threat of at least the size of your gain. 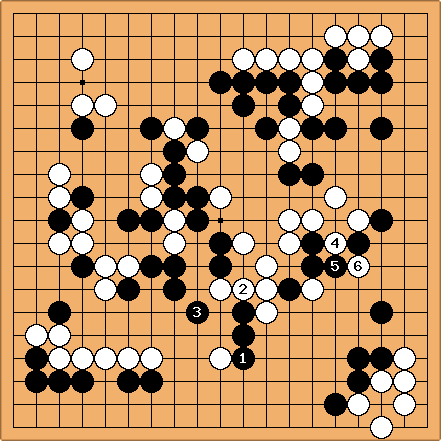 As such, winning the ko settles the position and simplifies the game considerably, leading to a clear advantage. This idea may not be intuitive to amateur players, as it involves starting a ko, which is seen as something complex. However, this technique sometimes appear in professional games. Applying this strategy effectively requires accurate assessment of the value of ko threats, as well as the value of winning the ko. 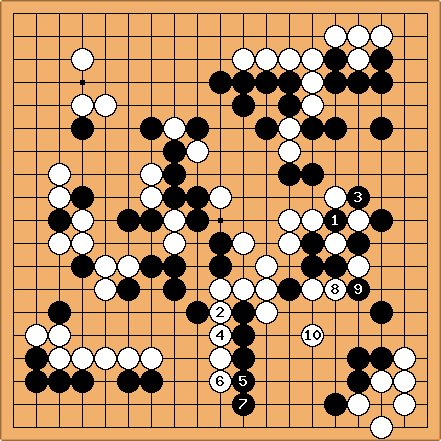 The following example comes from Fujisawa Hideyuki (Black) versus Kataoka Satoshi (White). Fujisawa explained that here is not meant to kill the White dragon, but to seal the game. White can only start the ko with and . Other than that, White has no other way of making sabaki. When and captures and finishes the ko, the entire right side becomes Black territory. On the other hand, and merely connects the dragon out, and are hardly worth any points. It is now clear who the winner is. White resigned shortly after this. Source: 《围棋棋力测验》 Vol. 3, Fujisawa et al. (Translated to Chinese by China University Students Go Association), 1990. ISBN: 7-80548-251-9.
tderz: Confusing Means and Ends? "When you are in a winning position, ... ", so the aim seem settled already? "... is to force your opponent to start a ko that s/he cannot win." = the means for the aim; but is it a game deciding ko AND if you know that s.o. cannot win s.th. have you won already? "Usually the ko is such that you make a significant gain..." = game deciding? + " ... while your opponent has no ko threat of at least the size of your gain." - well if everything is clear beforehand, then why still needing advice? unkx80: Okay, I think the problem is in phrasing. Perhaps "winning position" should be "advantageous position", so I have rephrased it accordingly.